Heroes: Rulers of the Laguz Banner & Forging Bonds + New Event Calendar! 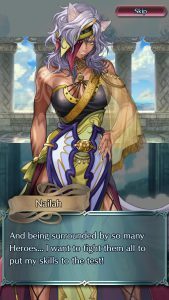 Our first four Beast units have just arrived in Fire Emblem Heroes! 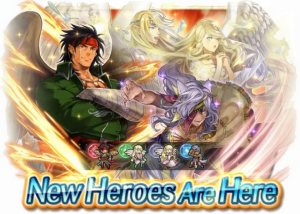 Spend your Orbs on the Rulers of the Laguz Banner for your shot at Tibarn, Reyson, Leanne, or Nailah. If you’d like to see more details, you can also check out our earlier article for their preview trailer and a text breakdown of their skills and abilities. 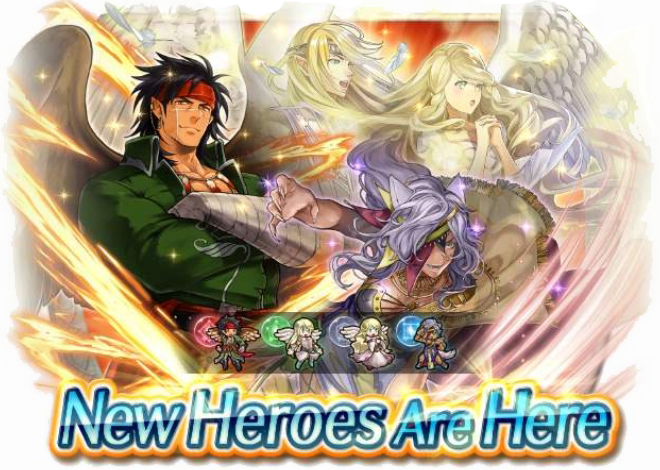 This banner also comes with two opportunities to see these heroes in action right away: a new main story chapter and a special event! 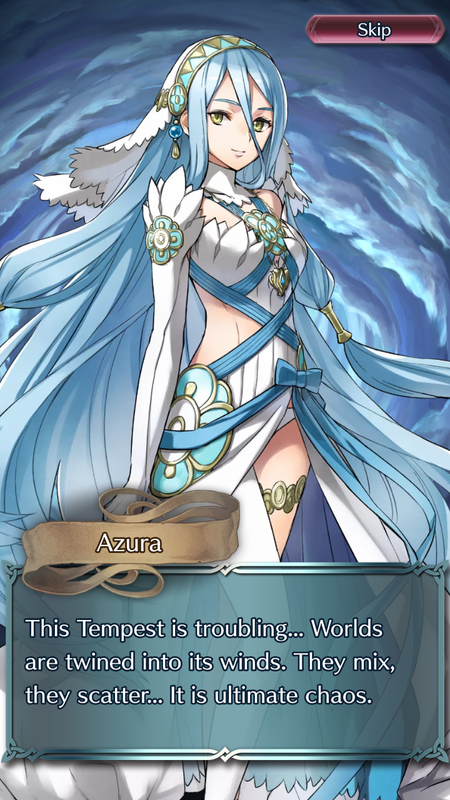 Book III, Chapter 3: Countdown gives us our very first glimpse of the new heroes. 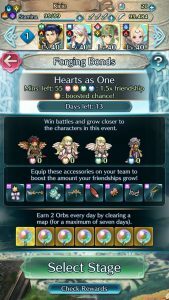 Complete all five chapters and their associated quests to earn up to 20 Orbs! Our four Laguz also take centre stage in the latest Forging Bonds: Hearts as One. 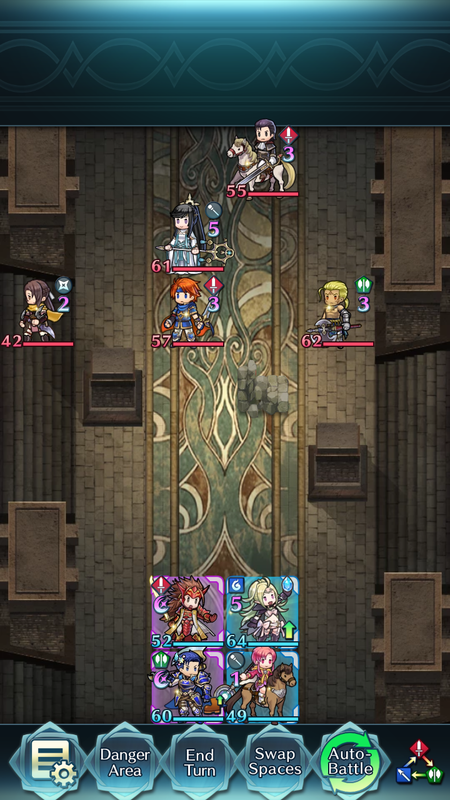 Sharena takes the time to show everyone around the castle and the Order of Heroes. As usual for Forging Bonds, compete in battles with accessories to gain the Friendship of our four newest allies. You’ll unlock special conversations with them, and also earn some rewards along the way! The rewards structure has changed slightly from previous events. 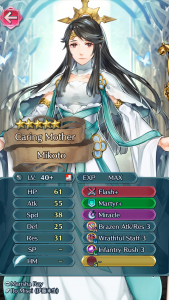 You now get a First Summon Ticket at 400 Friendship (instead of Hero Feathers), and also 10 Heroic Grails at 3500 (instead of one Orb). Other rewards appear to be the same. 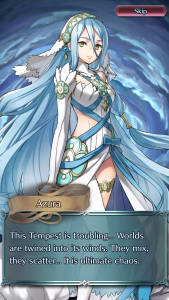 The Rulers of the Laguz Banner will be around for about three weeks, ending on 30 January. Forging Bonds: Hearts as One will last its usual length of two weeks, ending on 25 January. If you’re wondering what else will be going on over the next month, you’re in luck. A new January/February Event Calendar is now available! The calendar contains two new Special Heroes banners and also our first Mythic Heroes Summoning Event. The 2nd Anniversary Celebration for Heroes will also begin in early February! Click on the Read More for a text breakdown with date correction. 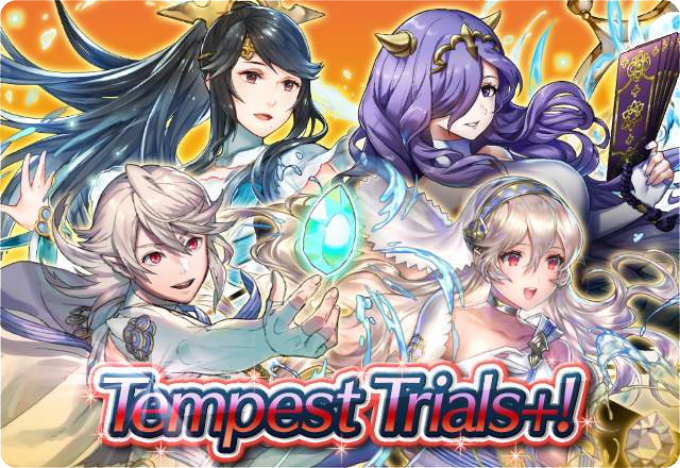 Another day means another news update for Fire Emblem Heroes! Today we see the release of a new calendar containing information on events that will be taking place from today until early January. 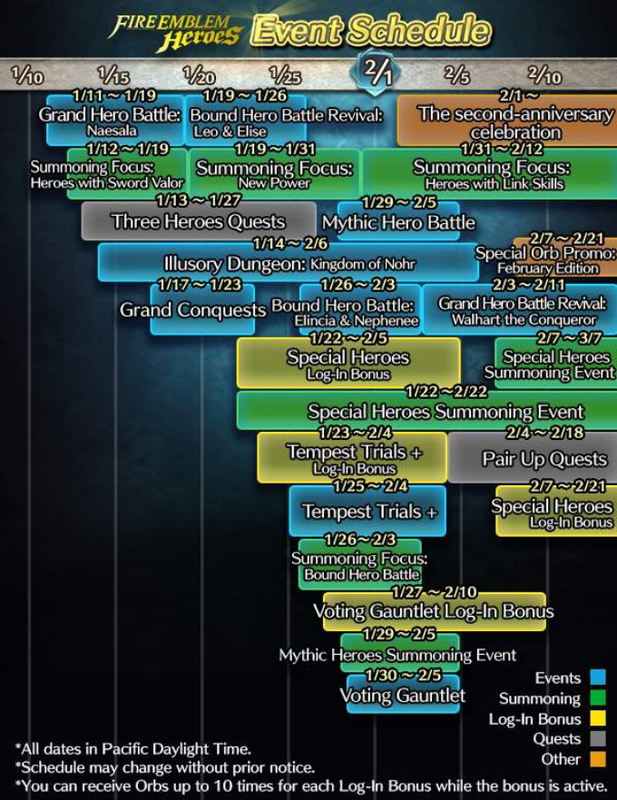 Please note that Intelligent Systems insists on using Pacific Standard Timezone (with a daily reset time of 11pm), so for most of us, this calendar is displaying events one day earlier than when they actually begin. IS had nothing more to say regarding the issue than “deal with it, eastern peasants.” They didn’t really say this, but it is probably what they are thinking. Assuming you’ve been keeping up with our front page posts this month, our friends at Reddit subs r/FireEmblem and r/FireEmblemHeroes, or perhaps just my personal Twitter, you know that I partnered up with r/FEH mod /u/DarkDogDemon for the second year in a row, to put what was our second collaborative charity benefit, Team FE’s ThanksFEving. We hosted the event to benefit Children’s Miracle Network Hospitals through the Extra Life campaign, and while we were anticipating success, we were floored at just how well things went. Twitch and YouTube (for VoDs/Rewatches), in case you missed anything. Not counting the several voice actors that offered up their hand in signing some goodies for giveaways/raffles/incentives (yes that pun was intended), we had more than fifteen voice actors and actresses join us live, on stream, to support the cause. Returning names include Greg Chun, our huge hit from 2017’s single VO appearance, as well as friend of Serenes Forest Rena Strober, both of whom shattered expectations and really made the event a memorable one with their contributions on top of their appearances. Not to sell the others short, we also had appearances from Brianna Knickerbocker, Rob Clotworthy, Kyle Hebert, Kaiji Tang, Kyle McCarley, Chris Hackney, Misty Lee, David Vincent, Yuri Lowenthal, Allegra Clark (twice), Christian La Monte, Carrie Keranen, Angela Marie Volpe, and to top it off with the VO that was on with us live as we beat our $10k goal, Lauren Landa (Several of which, also offered up their pen in support). It was a massive turnout, and I don’t know quite know how we’re going to top this next year. 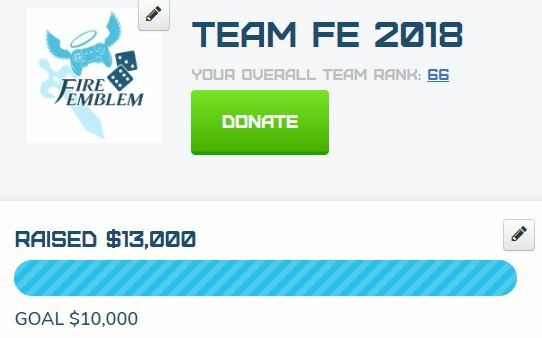 To summarize our success, where we managed to raise $3,540 last year, this year we managed to raise $13,000 of our $10,000 goal, which was nothing short of monumental. It’s impossible for me to express my gratitude to the community, but with support from our players/commentary team (Nairo, Gwimpage, Kirbymastah, Mekkah, AbdallahSmash026, Lord Raven, General Horace, Aethin, Aggro, Shephen, Funny Valentine, Gradivus, GreyWulfos, and Nimious) our artists (Soeda Ippei, ciarre, tecchen, Ravenide, and 24914), our technical streamer (N7_Commander_John), the support team featuring designers, advertising blasters and chat mods from all of our supporting communities (Artists of Askr, FE Compendium and the two FE subreddits), our sponsors at Unlocked, and anyone else who just helped our event either through contribution or simply word of mouth, I thank you from the bottom of my heart. 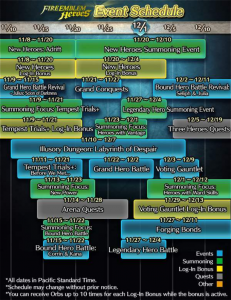 Heroes: Tempest Trials+: Before We Met + Nov/Dec Event Calendar! Another exciting event has begun in Fire Emblem Heroes! 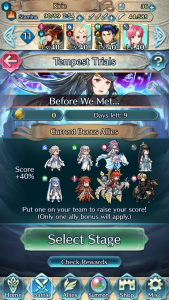 You can find Tempest Trials+: Before We Met in the Event menu as usual. Prepare your strongest team, and head into the storm. At the event’s main page, you can refresh yourself on the available Bonus Allies, see your current score and rewards, or start a battle whenever you’re ready. The final map this time around is based on Chapter 27 of Birthright. Mikoto appears as the map’s final boss. Check out the map layout and her stats and skills for the hardest difficulty below. As usual, you can earn a large variety of rewards this TT, including both a 4★ and 5★ copy of Azura: Young Songstress. She comes with her own special weapon, the Book of Shadows, along with some useful skills. Other rewards including some Sacred Seals (Gale Dance, Water Boost, and Atk/Def Bond), and of course plenty of Orbs! 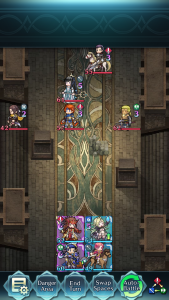 Tempest Trials+: Before We Met will last ten days, fading into the mist on 22 November. NOTE: Due to the changes in DST, the Event Calendar now displays events starting at 11pm Pacific Standard Time. 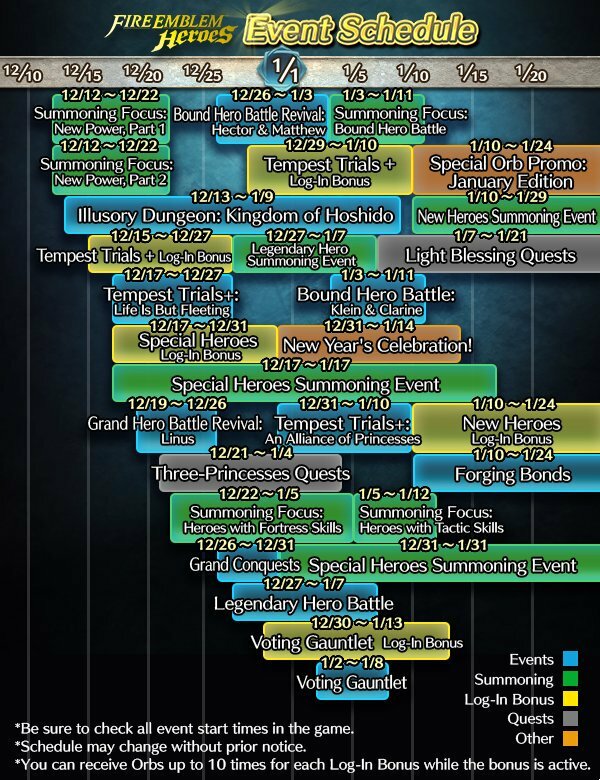 That means, for most Heroes players, the dates displayed on this calendar are actually one day early. For example, it lists today’s TT starting on 11 November. Keep this in mind! It looks like our next batch of New Heroes will be arriving soon, on 21 November! We’ll also be getting a, likely related, Grand Hero Battle and Forging Bonds event shortly after. There’s no indication of when we can expect the Version 3.0 update, however. 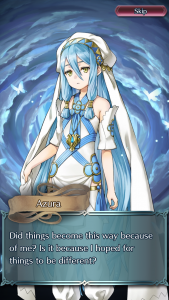 Perhaps either with or right after this next banner? Read on below for a full text version of the calendar’s listed events.